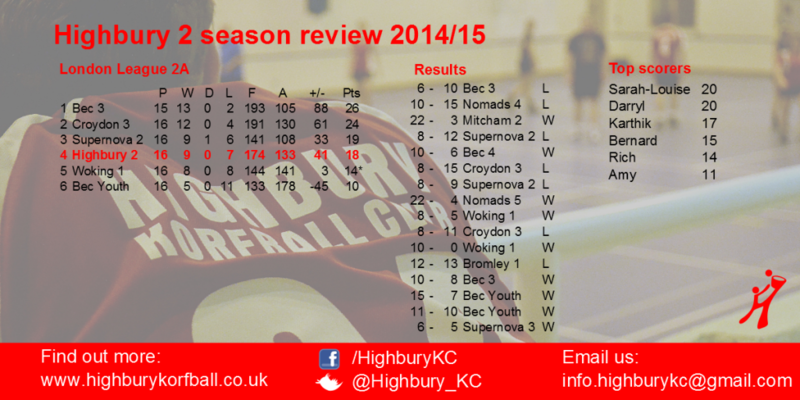 2015 was an amazing year for Highbury Korfball Club, on the field and off it. Top performances, socials, tournaments and so many new players joining the club. We’ve reflected on the best bits of 2015, here is the first part, January – June. Fireworks are the traditional start to a new year, and this was no different for Highbury as the year kicked off with a grudge match between Highbury 3 and Highbury 4. The teams had been pretty even all season and this showed on the pitch as they played out a tense and thrilling seven-all draw. 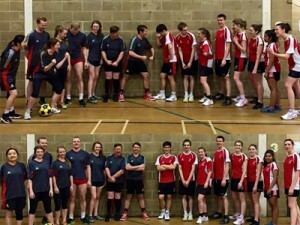 Fireworks were also flying the following weekend as the 1st team came agonisingly close to beating Bearsted in the England Korfball Promotion Division – the one word we’d use to describe the match – feisty. Love (and winning) was in the air in February. Some 20 of us headed up to Leeds on Valentine’s weekend to defend the Leeds tournament we had won in 2014. After the carnage of the previous year the biggest challenge was to get everyone to the matches on the Saturday – but not only did we succeeded in navigating our way through the plethora of pubs along the Otley Run and into the Leeds Students’ Union dressed as gangsters we all made it to the matches on time – a big improvement. On the pitch, not put off by stinking hangovers, our two teams performed heroics to face each other in the final, with Highbury 2 nearly pulling off the unthinkable and winning the tournament. Trophy, or rather box of Celebrations (Nicola can we have a better prize this year), successfully defended. 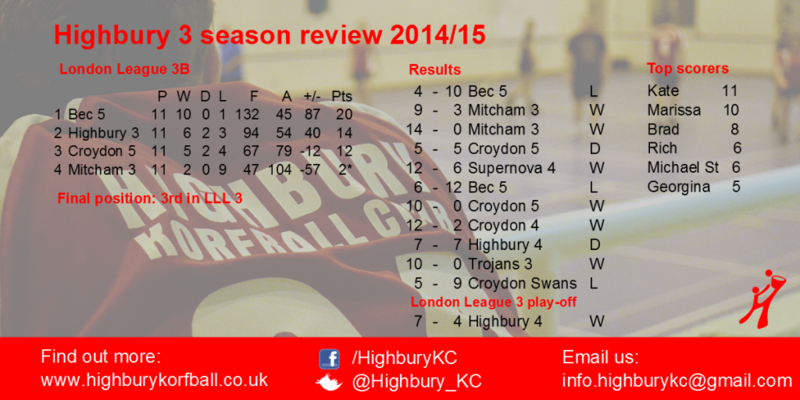 Back in the league and Highbury 2 were having a much better 2015 than they did 2014, and stunned top-of-the-table and unbeaten Bec 3, coming back from 6-2 down at half time to win by 10-8. Karthik was the hero from the bench, scoring two goals from down-town to win the match for the home side. 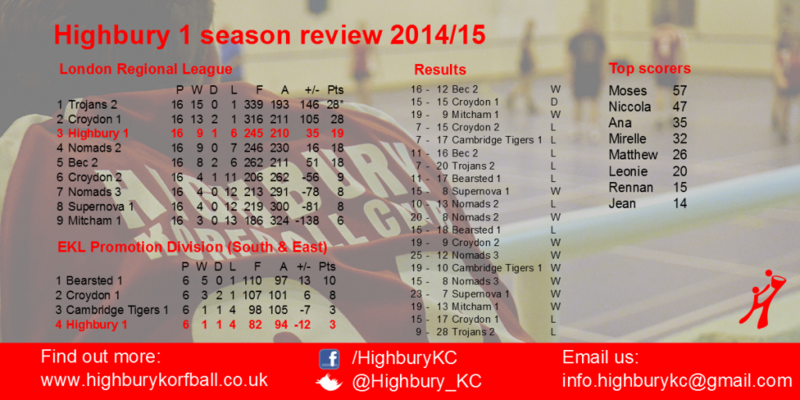 March saw the season come to a close for Highbury 2, 3 and 4. For Highbury 3 and 4 the stakes were high as they played off for 3rd place, having both finished 2nd in the respective London League 3 pools. Highbury 3 overcame their opponents convincingly, a win that would see the side promoted. Highbury 2 rounded off a fine 2nd half of the season with three wins – two against Bec Youth and an extremely hard fought 6-5 victory against one of the best sides in the division, Supernova 3, to finish in 4th place in London League 2. 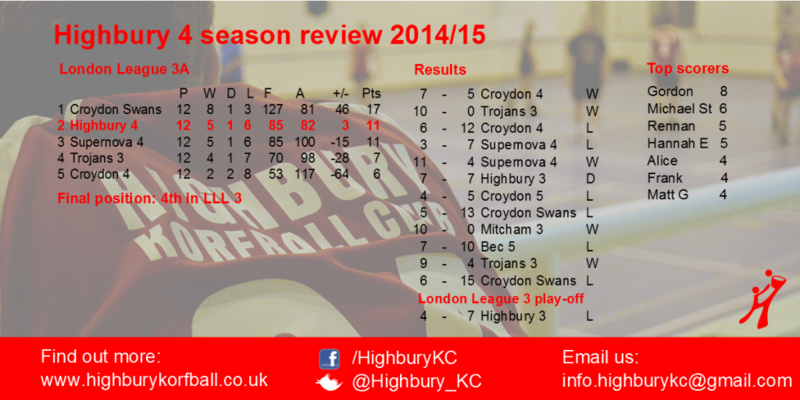 Highbury 1 recorded an emphatic win over Supernova, 23-7 in a good month for the team. Click here to watch the goals. April was all about Attila, the massive tournament in Eindhoven. After a few days taking in the culture and all that Amsterdam has to offer – mainly Heineken and karaoke – we headed across to Eindhoven. Opting to stay in the slightly more plush surrounds of the Holiday Inn, rather than the vomit and urine coated (eugh!) sports hall, we got stuck into the bars of Eindhoven before stumbling into the sports hall the next morning to attempt to play korfball. The second night was certainly eventful as we ‘got back on it again’. Some of us had a #TacticalNapInTheToilet, while others spent their time eating daffodils and dancing on the bar in a Flügel fuelled night of mayhem. 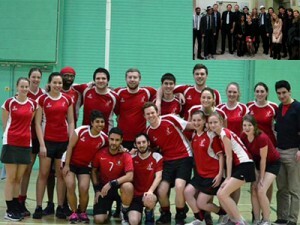 For some reason Highbury 1 still had a league game to play mid-April, and with players away we brought Sheep out of semi-retirement in a match against Trojans ‘2’ – which contained many of Trojan’s 1st team players in preparation for the korfball finals. We lost, but put up a good fight. 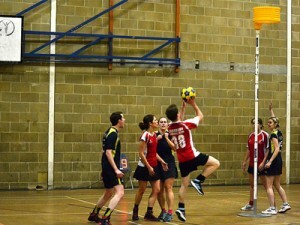 That left the 1sts in 3rd place in the league – a great finish and Promotion Division korfball secured for next season. 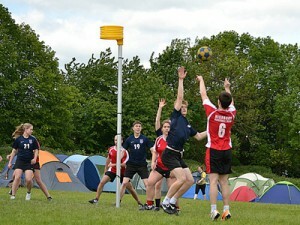 The summer was coming and that can only mean one thing – outdoor korfball! We got into the swing of the tournament season with a visit to UEA in Norwich and a trip to Leicester. We we won the UEA tournament (Dodds reliably informs me he scored the winning goal in the final). 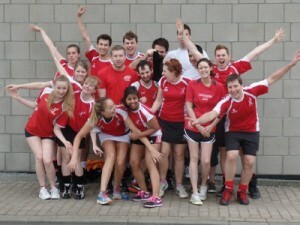 The socials were pretty epic too – we dressed as tennis stars for UEA and wore red for the Canadian (why Canadian?!) themed Leicester tournament. May also saw the confirmation that England international Steph Allen would be our squad coach for the following season. 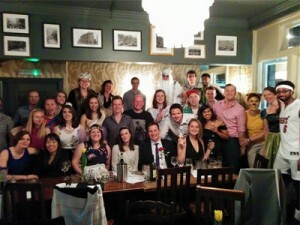 We got our party on in June with our big end of season celebration & AGM. Some 35 of us packed into the Kings Stores in central London for food and awards, before hitting up Strawberry Moons to dance the night away Highbury style. 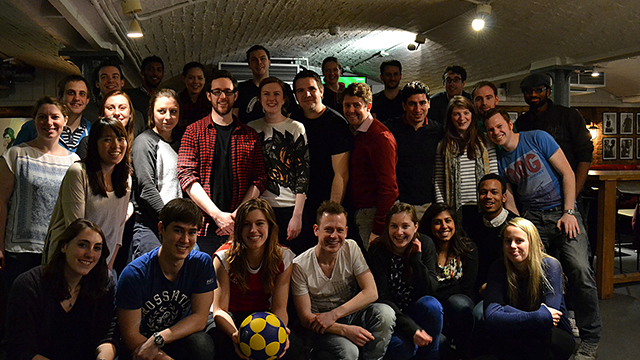 June also saw the start of our summer korfball programme with games in Finsbury Park – it was a great and visible way to bring korfball into the open in north London. We rounded off the month with a visit to a tournament in Oxford, returning with a pretty big trophy. That’s a wrap for the first half of 2015. We’ll be back soon to give you the low down of the rest of the year! We leave you with the season reviews.